Wish the best of happiness and health for your dearest brother or near ones with this Elegant Raksha Bandhan Hamper with Divine Rakhi on the auspicious occasion of Raksha Bandhan. 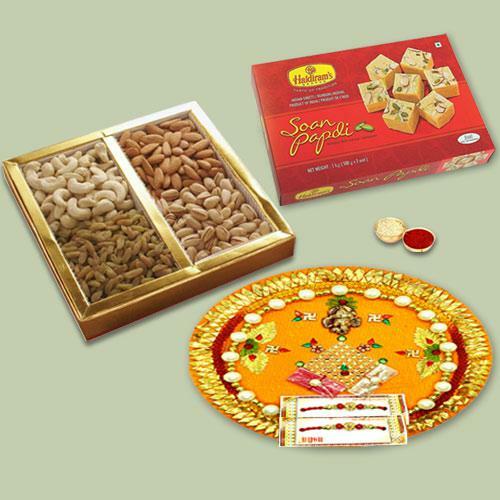 If you're looking for a gift that's a little different, then this Hamper is sure to delight as it is made of Bhaiya Rakhi, Soan Papdi 250 gm., Mix Dry Fruits 400 gm. and Traditional Thali with Roli Chawal.